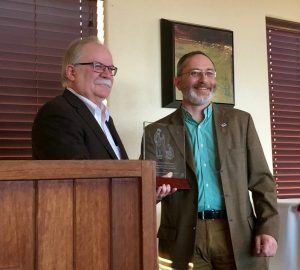 John Middleton, a professor at the MU College of Veterinary Medicine (CVM), has received the Distinguished Veterinary Alumni Award for excellence in teaching and research from Washington State University’s College of Veterinary Medicine. Bryan Slinker, Dean at Washington State University’s College of Veterinary Medicine, presents John Middleton with the college’s Distinguished Veterinary Alumni Award. Middleton earned a bachelor’s degree in veterinary science, a doctor of veterinary medicine, and a PhD in veterinary science from Washington State’s College of Veterinary Medicine. He also completed a large animal internal medicine residency at WSU, becoming board certified by the American College of Veterinary Internal Medicine, Large Animal Internal Medicine specialty in 1999. 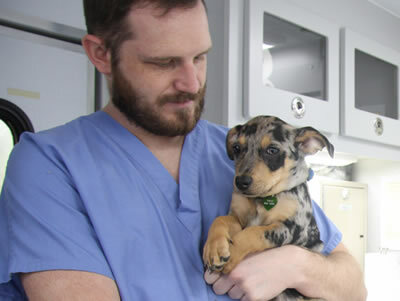 Middleton has been a faculty member at MU’s CVM since 2001 where his duties have included clinical service, teaching, research and administration. He has served as an assistant director of MU’s Agricultural Experiment Station since 2009. His research focuses primarily on the epidemiology, control, and treatment of bovine mastitis as well as other infectious diseases important to veterinary and public health. As an educator, he combines teaching and hands-on learning for students in the classroom and during clinical training. Among other honors and awards, Middleton has received the National Mastitis Council Distinguished Service Award for Presidential Performance and the Zoetis Award for Veterinary Research Excellence in 2015. He was named a top faculty achiever by MU’s chancellor in both 2015 and 2017. Most recently, the American Veterinary Medicine Association’s Council on Research elected Middleton to serve as its chairman. Middleton, his wife and two children reside on a small farm outside of Columbia where they raise sheep and hay. In his free time, he enjoys off-road driving, camping and restoring old cars.